Landscape boulders can provide a natural look to your landscape design. 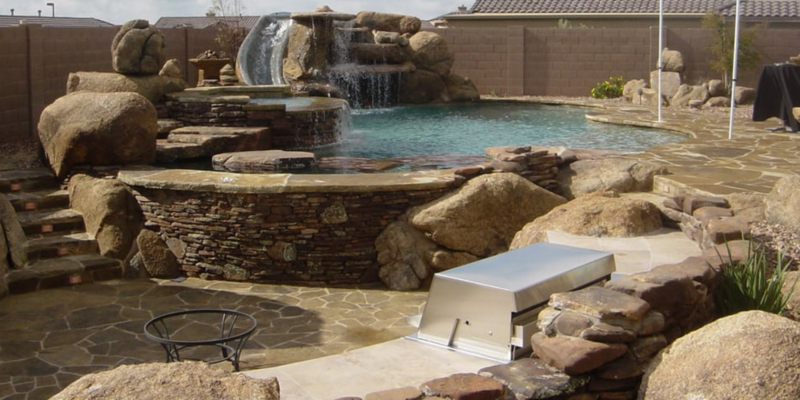 Arizona proudly displays a naturally rocky terrain, therefore, the addition of boulders to a landscape helps to add dimension. Boulders serve to showcase and dramatize your plants and succulents which will provide the finishing touch that will enhance your desert landscape. Envirogreen’s landscape designers have been working in the valley for over 14 years, so our team knows the ins and outs of Arizona’s rocky terrain. Landscape boulders come in all shapes and sizes. We provide a large selection if boulders including many different colors and mineral compositions. Large, heavy boulders are more expensive. This is due to the cost associated with moving and installing the boulders. If you are on a budget, then we recommend choosing boulders around the 2′ x 2-1/2′ dimension. We have found that a cluster of these medium stones can serve to have much the same effect as a larger stone. There are many different styles and types of material to choose from when it comes to this large sized desert rock. Installing boulders should look natural in your landscape. We install our landscape boulders with approximately the bottom third buried underground. This makes the boulder appear as if it has always been there. Landscape boulders need to be clustered correctly. They should be situated within or alongside a mound to have a most profound, natural looking effect. These simple yet stunning additions are perfect for virtually any landscape style. Lovely natural or even faux boulders can be incorporated just about anywhere. They are sure to add value and an aura of natural beauty to your outdoor living space. Using boulders is a great way to break up a landscape and accentuate a landscape. Other ways boulders can be used in a landscape is to create waterfalls, create terrain and build barriers. They are also great to use as an accent piece for your yard and can really be a great focal point. Consider lighting as well. 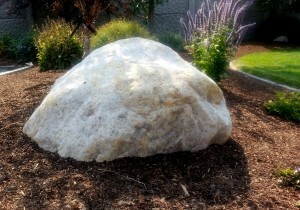 Lit correctly a boulder in your yard can add mystic and personality to your landscape.